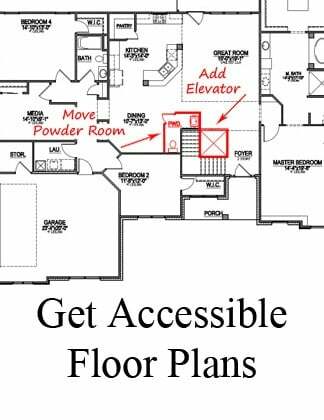 Creating everything just the way you want it means more than a great floor plan for your new custom home. It also gives you the ability to tuck in all the storage space you need, with nooks, crannies, and depositories all over the house. Here are the top five rooms homebuyers seek to take control of - from Great Rooms with built-in storage to Laundry Rooms with secret compartments. Kitchens can easily become packed to the brim - with appliances, food, school books, mail, and on and on - as the central gathering room of your home. Get tips on how to design a kitchen with enough storage to meet all your daily needs, below. 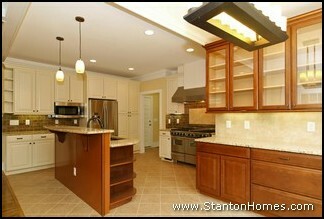 -Islands can add tons of storage - sometimes doubling the space in a kitchen. 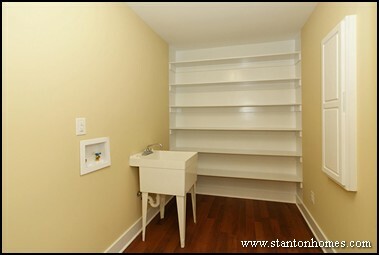 Open shelving units are an added bonus. - Butler's pantry storage is immensely helpful, usually located just around the corner. - This custom kitchen features a cabinet pantry (not a traditional walk-in closet pantry) - just to the right of the refrigerator. A cabinet pantry can disguise food storage, and you can tuck a secondary walk in pantry around the corner in the mudroom or hallway, for easy storage of additional appliances along with "Costco" size packages. Master bathrooms always seem to turn into organizational chaos. These storage solutions will help you keep control of your space! 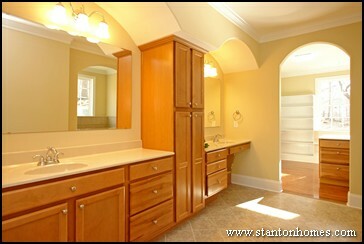 - Tons of cabinetry storage below the double vanity is a must-have for home buyers in NC. 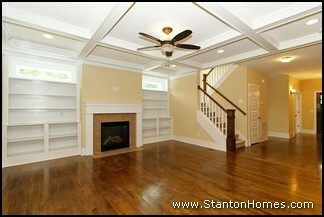 - Open shelving is an added bonus. In this master bathroom, the open shelving is designed for hand towels and toiletries. - Consider adding an additional linen closet - your custom builder can work another closet into nearly any space. Great rooms add more than open living to your home. They are also packed with creative storage options. - Built-in bookcases allow you to organize movies, books, and board games - leaving space for nick-knacks and holiday decor. 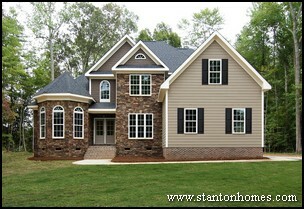 - Entertainment centers built in above the fireplace are very popular in North Carolina new homes. 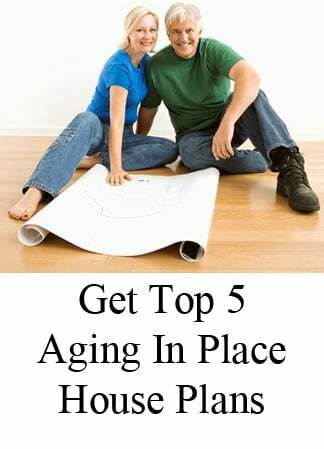 Decide ahead of time whether or not you'll have a flat screen tv above the fireplace. Your builder will need to include the appropriate outlets. 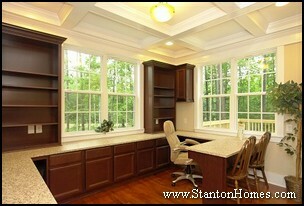 Need a professional home office? These features will keep you focused and efficient. - Wrap-around storage cabinets can hold all your files. - Bookcases with built-in electric outlets allow you to store all the materials you use on a daily basis, and include a charging station or fax machine too. Large windows can be added to alternate with bookcases and keep the room bright and friendly. - You'll never run out of surface space with a wrap-around desk. The peninsula desk design provides a convenient co-worker or client meeting space. Sometimes it feels like our chores are never done - especially the laundry. - Full wall of open shelving. - Hidden ironing boards - saves space, and you don't need to carry it around! - Drop-in sink. Pre-wash delicates, and prevent mud and dirt from tacking through your home. Looking for ways to maximize storage space in your master bathroom? 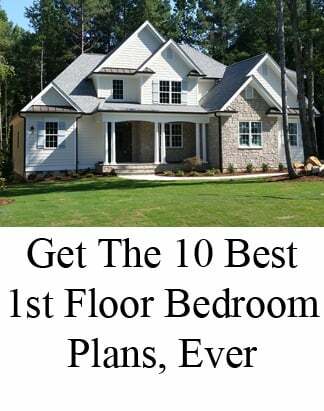 Here are four ideas to consider when designing your North Carolina custom home. In this first master bathroom design, a floor-to-ceiling storage cabinet was included between the his-and-hers vanity set. This tall cabinet was designed to fit inside the vaulted ceiling. With a full-size cabinet, you will never run out of space for spare towels, supplies, toiletries, and everything else you want to pack inside! The square tiles listello accent pieces in the soaking tub and shower were chosen to complement the cabinetry color tones. 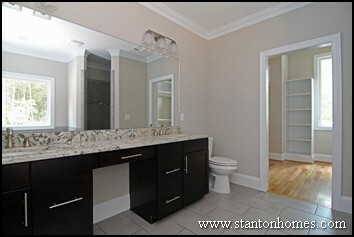 Here is another example of a floor-to-ceiling storage cabinet in the master bathroom. In this custom home design, the tall cabinet provides more than enough storage space to accomodate for the loss of storage in the roll-under accessible vanity. In place of a closet cabinet, consider adding open shelving. You will still gain extra storage space, with the added bonus of a showcase area. In this custom home master bath, the homeowners plan to place eye-catching white towels inside the espresso cabinetry shelving. 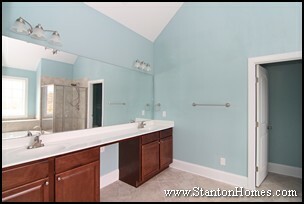 This master bath also includes a set of extra-wide drawers below the open shelving. 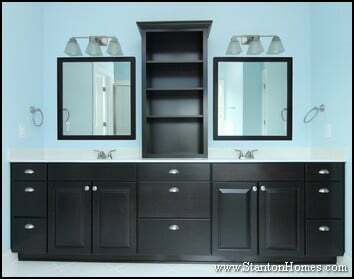 Some homeowners choose to leave a gap between the his-and-her vanity cabinetry sets - typically called a "knee space." The knee space can be vanity height, or that segment of countertop can be lowered to a comfortable "chair height". This space can be used in several ways. 1. It can be designed to fit a chair - so you can sit while, for example, putting on make-up. 2. It can be designed as a place to tuck in a laundry basket or towel basket. 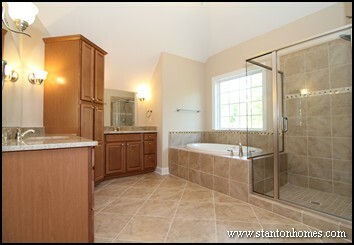 Master bathrooms featuring separate his-and-hers vanities are always popular. And in many master bath designs, separating the vanities can actually maximize the use of floor space. - You'll never have to bump elbows during the morning rush! See more master bath photos on Pinterest! 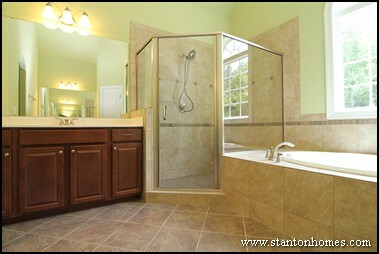 Read about other North Carolina custom home master bathroom trends, ideas, and styles. 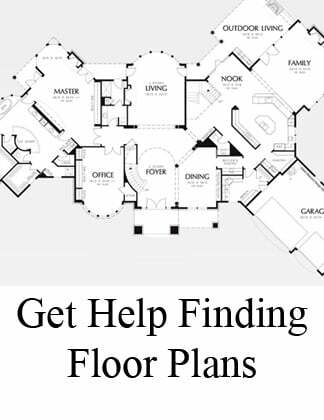 You'll find: tile surround ideas, master bathroom layouts, popular types of tile, ceilings styles, and much more. Types of Tile - Which Types of Tile Are Used Most Often in Master Baths and Kitchens?